Two years ago Jonathan Flannery stumbled onto a human trafficking operation and rescued the beautiful, abused Mara. Mara's testimony against her uncle, the leader of the operation, put him in prison and gave her freedom from sexual slavery. When Jonathan returns from Bible college for the summer and their paths cross, Mara finds herself longing for him, though she swore off all men long ago. Intentionally discounting her sudden affection for Jonathan, Mara focuses on her waitressing job until a man and young girl appear one day. Mara is certain that they are involved in human trafficking but feels lost as to what to do. More than anything, she wants to stay far away from her past. Adding to her distress, Mara suspects she is being followed by someone hired to exact her uncle's revenge. Special Delivery by Kathi Macias is the second book in the Freedom Series. I highly recommend reading Deliver Me From Evil, the first book, prior to reading Special Delivery. The story could stand alone, but reading the books in order makes for a more meaningful reading experience. A well-written story with heart-gripping characters, Special Delivery catches and retains the reader's attention from the very beginning. Macias handles the subject of human trafficking by providing a hefty dose of reality coupled with gentleness towards its victims. I highly recommend this series to any adult, as it is probably not appropriate for younger readers. It is Christian fiction. However, I think everyone should be aware that such atrocities do happen in America and ignoring reality only leads to more victims. 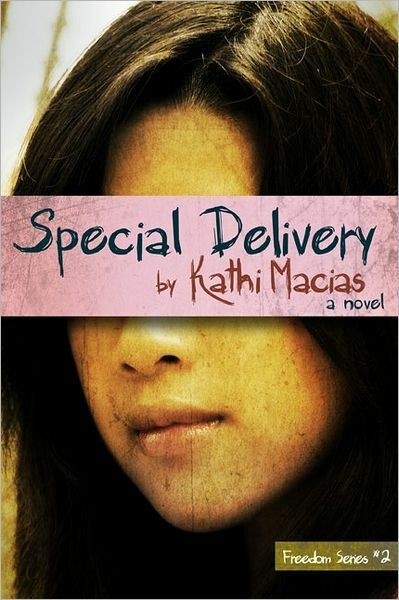 Click here to read the first two chapters of Special Delivery by Kathi Macias. Disclosure of Material Connection: I received this book free from the author via Pump Up Your Book. I was not required to write a positive review. The opinions I have expressed are my own. I am disclosing this in accordance with the Federal Trade Commission’s 16 CFR, Part 255: "Guides Concerning the Use of Endorsements and Testimonials in Advertising." Thanks for hosting Kathi today. I'm glad you liked this book as much as the first one. I definitely feel they should be read together too. It makes Mara's story that much more powerful.